Red blood cell: The blood cell that carries oxygen. Red cells contain hemoglobin and it is the hemoglobin which permits them to transport oxygen (and carbon dioxide). Hemoglobin, aside from being a transport molecule, is a pigment. It gives the cell its red color (and name). The mature red blood cell (RBC) is a non-nucleated biconcave disk. Thanks to this unusual shape and its hemoglobin content, the RBC is superbly suited to the transport of oxygen. 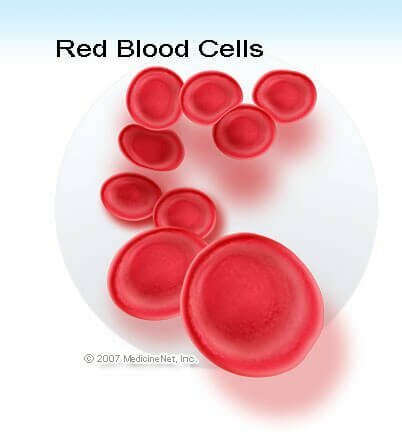 A red blood cell is sometimes simply referred to as a red cell. It is also called an erythrocyte or, rarely today, a red blood corpuscle.